The Power-HV 5,9V adaptor is a voltage-/currentlimiter for servos and RC-accessories with max. 6 V allowed voltage. 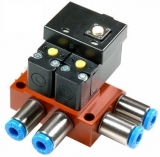 This enables 6V components to be used in HV-radio control systems with 2s LiPo 7,4V supply. The current limiter is also very useful as a servo protection agains overload e.g. in new direct controlled nosewheel steering. The Power-HV is simply put between receiver/PowerJack and servo. This Product was added to our catalogue on Tuesday 03 July, 2012.